Well, today's post was going to be a lovely romantic one about getting the LSH back in the saddle and starting a new phase in our lives as he and Flurry get used to each other as hacking companions to me & Aero. I took a few "through the ears" shots as we went along, him and Flurry striding out ahead, another one of him & Flurry alongside Aero's head... you get the idea. 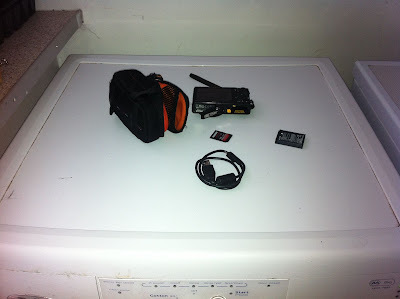 When we got home, I announced "I'll put a numnah wash on" and gathered up the numnahs, picked up my cap, camera and keys and headed down to the house. When I came back in for lunch, some two hours later, the wash was finished, so I went to hang it out. What on earth was the black thing in there? Oh no.... my camera case... was there any chance the camera inside was dry? The whole lot is currently drying on the window sill. There's a possibility I'll be able to retrieve today's photos off the card but I'd say there's a snowball's chance in hell that the camera will ever work again. I was very fond of it after the whole France thing. RIP, Coolpix, I'll miss you. Oh no!! I hope you can at least get the photos!